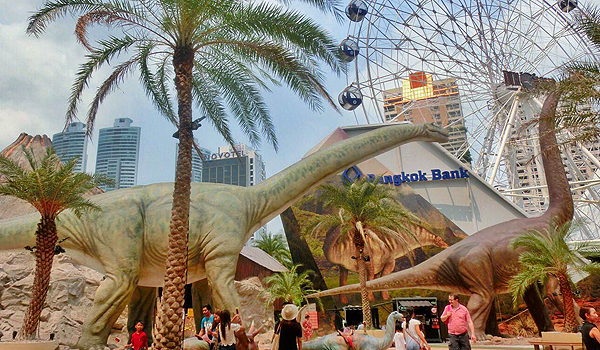 Put on your paleontologist’s hat and get ready for a wild ride, as you enter one of the Thai capital’s newest and hottest visitor attractions – the awesome Dinosaur Planet Bangkok. You’ll travel back millions of years to a time when fearsome giant lizards stalked the Earth, and discover amazing facts about dinosaurs, how they lived, and how they became extinct. With around 200 life-size models of dinosaurs scattered around the park, kids (and adults too) will find plenty to entertain and educate them, with more than a few scares along the way. 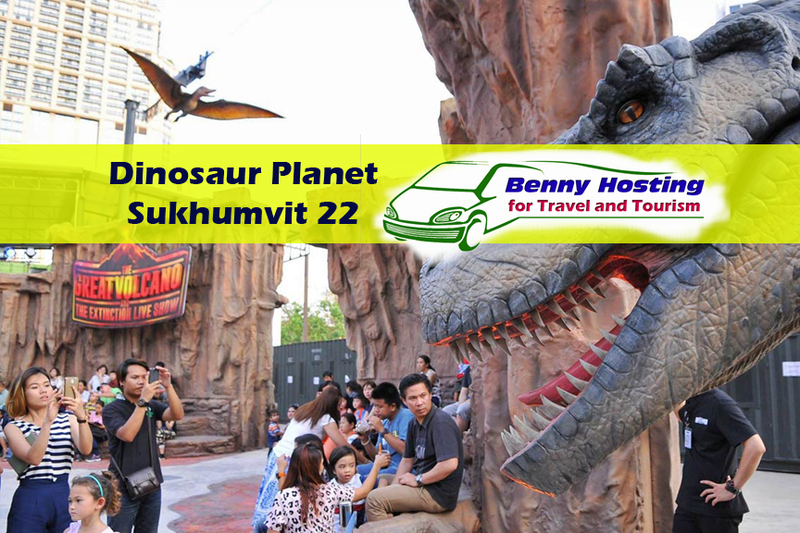 Situated in the Phrom Phong area of Sukhumvit, downtown Bangkok, you’ll find it easy to get to Dinosaur Planet, but perhaps hard to leave – it’s not just the incredibly lifelike dinosaur models that captivate the imagination here, but a number of well-designed rides and showpieces, centred around an impressively realistic volcanic eruption. 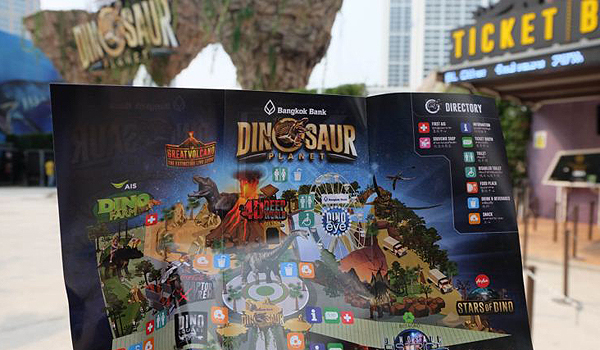 Welcome to Bangkok Dinosaur Planet, without a doubt one of the most exciting and enthralling attractions in Thailand – please don’t feed the T-Rex. 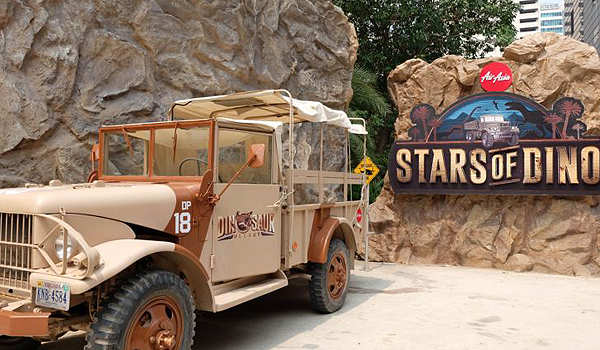 Begin your visit with a stroll through the spectacular Dinosaur District. Here, with the aid of multimedia technology and amazing replica skeletons, you’ll find out about different types of dinosaurs, how they behaved, and what they liked to eat. Why did the Stegosaurus have plates on its back? How much did a Brontosaurus weigh? How fast could a Tyrannosaurus Rex run, and why did the Diplodocus have such a long neck? 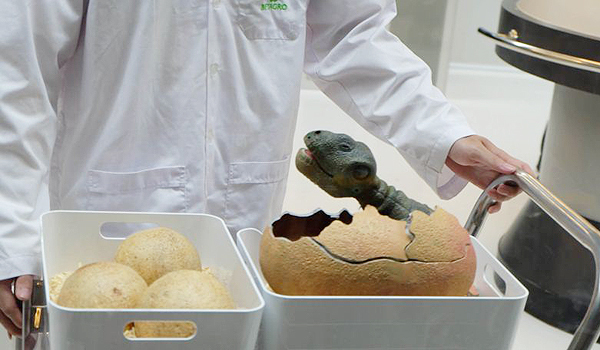 All these questions and many more will be answered in the mesmerising Dinosaur District, where you can also watch a nest of dinosaur eggs begin to hatch in the Dino Lab – just like Jurassic Park! Afterwards, it’s time for a journey through the three historic dinosaur periods – Triassic, Jurassic and Cretaceous. Learn which dinosaurs were on the Earth at different times, explore the land of big beasts, and watch out for Tyrannosaurus Rex and friends hiding behind trees, bushes and rocks. Magnificent views, not just of the dinosaurs below, but also the mesmerising Bangkok skyline, can be had from the unique Dino Eye. 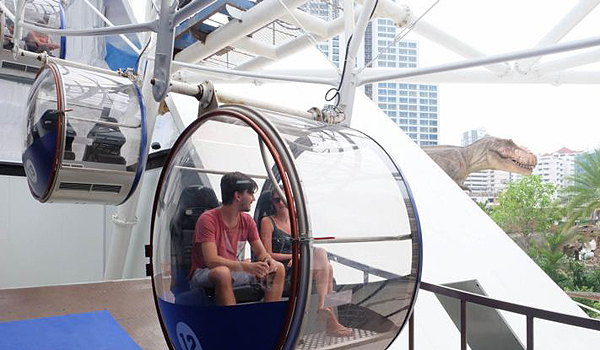 A 50 metre-tall ferris wheel with spacious and comfortable glass capsules spins gently around, while you observe pterodactyls and giant woolly mammoths going about their business. 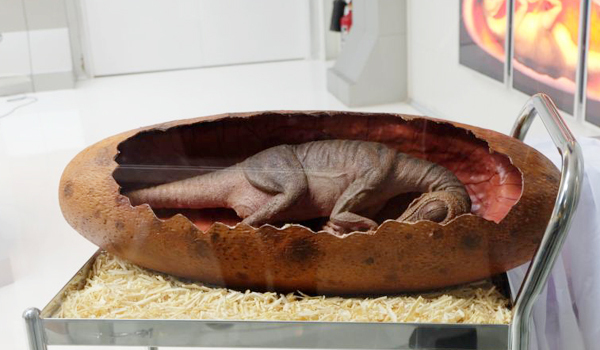 Perhaps the most relaxing part of any visit to Dinosaur Planet, and certainly one of the most popular, so maybe leave it until the end of the day when the crowds thin out. 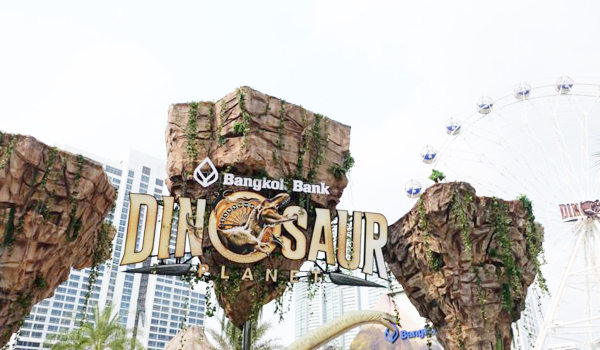 You can also see Dinosaur Planet Bangkok from another angle with the astonishing 4D Deep World adventure, taking you under the ocean to watch huge dinosaurs engage in battle before your eyes. The visual trickery, sounds and other sensations combine to make it feel as though you’re actually there in the thick of the action. Of course, no dinosaur-based theme park would be complete without some hair-raising escapades, and the Raptor X-treme experience has plenty of thrills. Quick thinking and nerves of steel are vital if you’re to escape these deadly hunters that prowl in packs after the unsuspecting visitor. 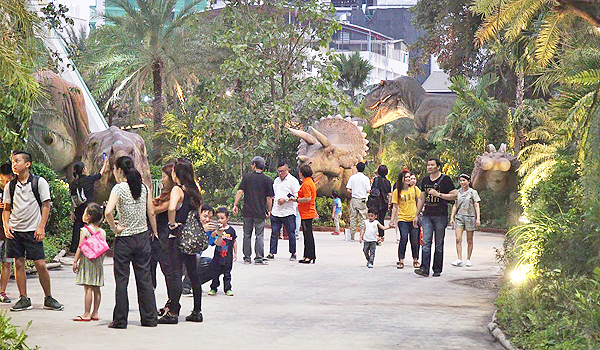 If you’d prefer a calmer experience then you can also explore the Dino Farm. Meet the peaceful herbivores Triceratops and Ankylosaurus, take a ride on a dinosaur, and help the kids unearth ancient fossils in a special palaeontology zone full of educational and fun games. We may never know for certain how the dinosaurs became extinct, but one popular theory is huge volcanos that made the planet unsuitable for them. 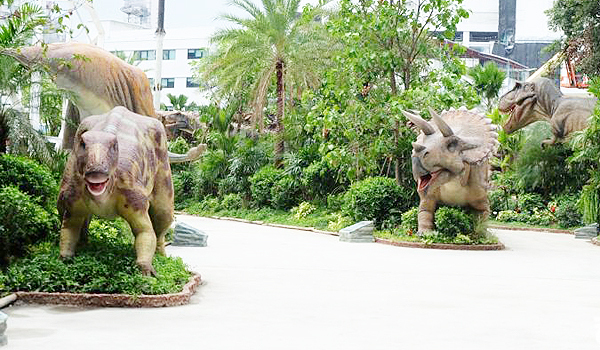 The centrepiece of Dinosaur Planet Bangkok is an entertainment extravaganza using state-of-the-art light and sound techniques. 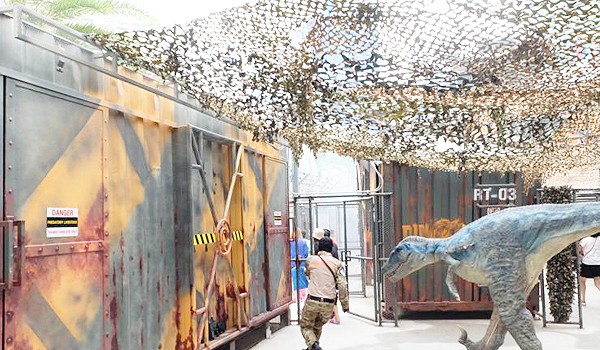 You’ll be immersed in a huge volcanic eruption, and watch as the dinosaurs struggle to survive. 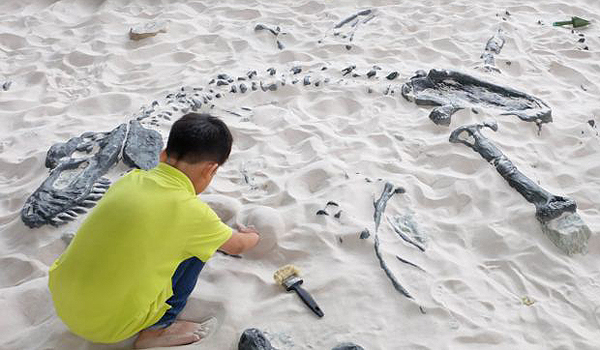 Ever since we first began finding their fossils buried in the earth, people have been fascinated by dinosaurs. 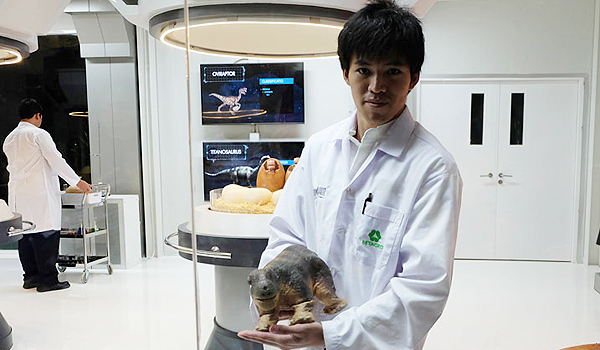 Dinosaur Planet Bangkok now brings you closer than ever to the world of these enormous creatures, illuminating how they lived and how they may have disappeared. As a fun family attraction in Bangkok, this place takes some beating. For children 4-12 years old we charge 100% of the price that calculate from a total number of adult pax.